'Dwarves!' said Bilbo in pretended surprise. The most obvious interpretation of 'dwarf-ridden pony' in this, or perhaps even most contexts, is 'ridden by a dwarf'. 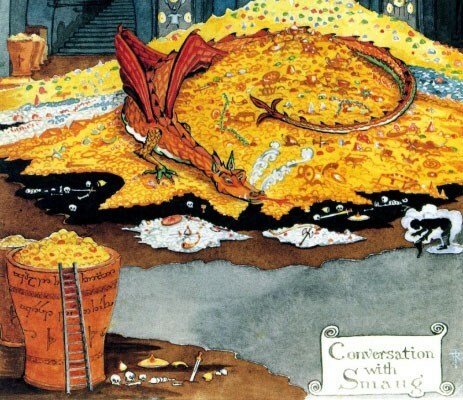 But that's not the only possibility, and in a conversation so full of riddling and wordplay as that of Bilbo and Smaug we might want to consider the following. From Old English bӕddryda, or bedreda, comes the modern 'bedridden.' From 'bedridden' by analogy descend various words, e.g., 'bird-ridden' (1835), 'bug-ridden' (1848), 'bureaucracy-ridden' (1861), 'capitalist-ridden' (1844), 'caste-ridden' (1840), 'chair-ridden' (1885), 'chamber-ridden' (1856), 'child-ridden' (1843), 'class-ridden' (1842), 'conscience-ridden' (1617), 'crime-ridden' (1801), 'devil-ridden' (1707), and, not to belabor the point 'dragon-ridden' (1922) 'pixie-ridden' (1893), and even 'Nazi-ridden' (1942). A search in the OED for *ridden reveals these and over a hundred other such formations from the beginning of the alphabet to the end, only a few of which -- such as 'overridden' the past participle of 'override' -- have other than a decidedly negative connotation. The noun modified by the *ridden adjective is oppressed, beset, infested, or otherwise disabled by the first part of the compound. From Smaug's perspective, then, ponies ridden by dwarves are also infested by dwarves, vermin-ridden, as it were. The dragon's wordplay in this sentence is followed up in the next, as he promises Bilbo, who came from 'the end of a bag', that with friends like dwarves he will come to a bad end. The tongue of the worm doesn't miss a turn, any more than the pen of Tolkien does. Note: I would like to thank my friends, Shawn Marchese and Alan Sisto, of The Prancing Pony Podcast, since it was while listening to their reading of this passage on my way to work this morning that the other interpretation of 'dwarf-ridden' occurred to me. 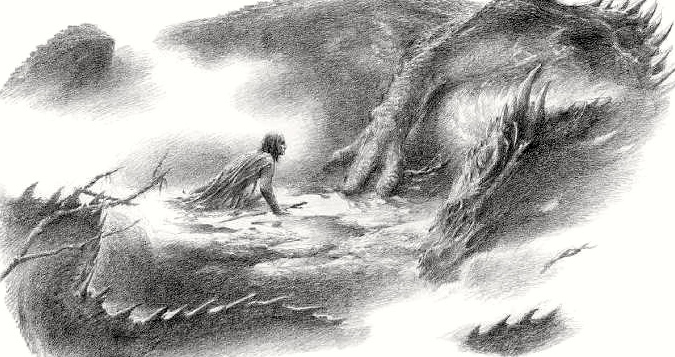 By 3 April 1944 Tolkien had started work on The Taming of Sméagol (Letters, no. 58). By the end of the month of May he had a finished draft of the whole of book IV, and moved C. S. Lewis to tears by his reading to the Inklings of The Choices of Master Samwise (Scull and Hammond  1.291). He had also perforce begun to give thought to what Mordor was like. No one who has read the books will need reminding that ashes, dust, fumes, and smoke figure prominently. It has also long been clear that Tolkien's experience of the trenches in World War One had a profound influence on his descriptions of the blasted landscape of Mordor and the Dead Marshes (Scull and Hammond  3.1408-1409). Starting on 20 March a series of articles record the devastation in precisely the terms one would expect to find: fountains and flows of lava, ash, smoke, mud. Symptoms of the eruption continue to subside, though the crater is still emitting immense volumes of smoke, often, as throughout yesterday, dirty black smoke, making the mountain look like an immense brick kiln. The pilot of an aircraft flying yesterday to Naples from Palermo encountered this cloud 50 miles out at sea. After flying for 40 minutes in pitch darkness he preferred to turn back and circumvent the volcano by flying inland over Salerno and by the valley eastward from the crater. And looking with dismay up the road towards Bag End [the hobbits] saw a tall chimney of brick in the distance. It was pouring out black smoke into the evening air. Like a dream the vision shifted and went back, and he saw the trees again. But this time they were not so close, and he could see what was going on: they were not waving in the wind, they were falling, crashing to the ground. But now Sam noticed that the Old Mill had vanished, and a large red-brick building was being put up where it had stood. Lots of folk were busily at work. There was a tall red chimney nearby. Black smoke seemed to cloud the surface of the Mirror. Of course when Frodo and Sam finally do arrive home, they discover that Sam's vision of the ruin of their 'own country' has come true; it is in fact 'worse than Mordor' (RK 6.viii.1004, 1018). To survive the war only to confront this 'was one of the saddest hours in their lives' (RK 6.viii.1016). That great chimney fouling the air with its black smoke looms over them just as Vesuvius did over the surrounding countryside. 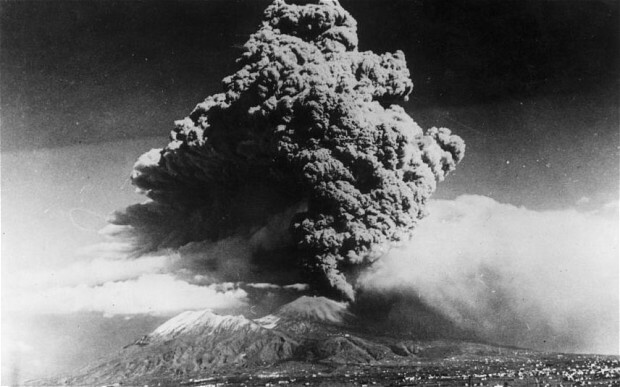 On 16 March 1944 the people living near the volcano must have thought that, with the war and fascism behind them, they could 'have just a nice quiet time in the country' (RK 6.viii.1018), that life could return to normal. 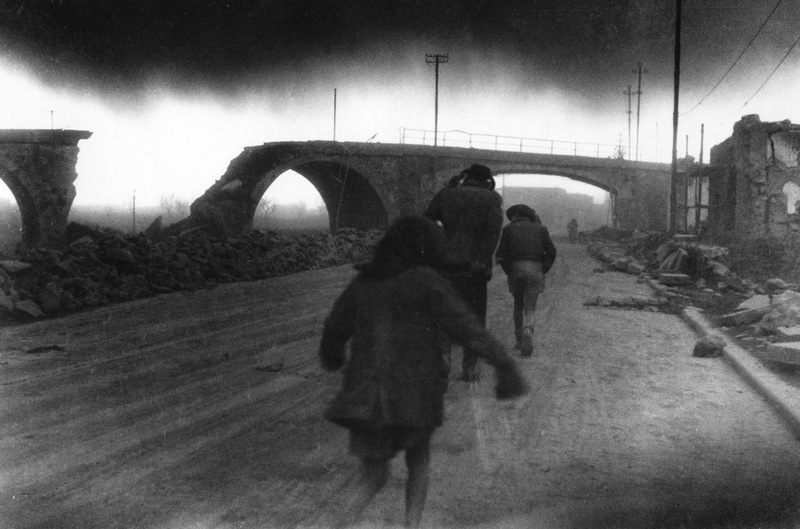 Did the newsreels and reports out of Italy influence Tolkien's portrayal of Mordor and the post-war Shire? The image of the chimney belching black smoke suggests it might have done so, but smoking factory chimneys were not an unusual sight in his day, and a man from Birmingham with his likes and dislikes would not have had far to go to come up with such an image. That Britain had already suffered extensive destruction from Nazi bombs, far more than it had during the first war when the necessary 'machines' were in their infancy, would have encouraged such a comparison. This is especially true since Italy itself had suffered from Allied strategic bombing, of which he disapproved: 'So we come inevitably from Daedalus and Icarus to the Giant Bomber. It is not an advance in wisdom!' (Letters, no. 75); 'But it is the aeroplane of war that is the real villain' (Letters, no. 100). Despite his admiration for the courage of the RAF's pilots and crews, and despite his son Christopher's serving in it, Tolkien found himself at odds with the idea of the RAF (Letters, no. 100). In San Sebastiano they said there was a deathlike quiet except for a faint gurgle as the black crust of the lava broke and a mass of white-hot rock oozed out to advance a few more yards. About a third of the town had already gone; where it had stood was nothing but a big slag heap of lava, and a memory. Of the houses and shops that were there, neither stick nor stone remained in sight and would perhaps never see the light of day again. Bombs make a terrific row and leave ruins. Lava makes no sound and leaves – nothing. Can you imagine a 10 to 30 foot mass of molten rock slowly engulfing Wembley High Street, and, when it is all over, not a stone was left in sight? Sounds crazy, but that’s the way it is. The lava slowly approaches a building, the heat setting it on fire, and starts seeping through doors and windows like a lot of thick treacle. The lava continues to flow in as into a mould, until the pressure of thousands of tons of molten rock becomes too much, and the building collapses, sinking through the thin crust and disappearing for ever. * So much for flying the Ring into Mordor. Presently it grew altogether dark: the air itself seemed black and heavy to breathe. When lights appeared Sam rubbed his eyes: he thought his head was going queer. He first saw one with the corner of his left eye, a wisp of pale sheen that faded away; but others appeared soon after: some like dimly shining smoke, some like misty flames flickering slowly above unseen candles; here and there they twisted like ghostly sheets unfurled by hidden hands. But neither of his companions spoke a word. In the one scene the candles light a nightmare of evil and a sorcerous illusion, in the other a blessed vision of darkness banished by the real presence of the Grail. Did Tolkien know this scene in Wauchier? It's not unreasonable to suppose that he did, but I have yet to find any proof. A curious parallel is all it may be, but worth noting nonetheless. Plutarch's Agesilaos tells the story of a power struggle for the throne of ancient Sparta. When Agis II died in 400, his younger brother, Agesilaos challenged the claim of Agis' son, Leotychides, on the grounds that he was illegitimate. When it was objected that Agesilaos could not succeed his brother because he had a limp, and a prophecy warned that Sparta should beware lest 'lame kingship' (χωλὴ βασιλεία) harm the state, which till then had been 'sound of foot' (ἀρτίποδος; Ages. 3.3-4), by dint of superior cleverness -- and no doubt better politicking -- the cause of Ageslaos prevailed, arguing that the real 'lame kingship' would result from an illegitimate heir taking the throne (Ages. 3.5). ὡς ἴδον Ἥφαιστον διὰ δώματα ποιπνύοντα. When they saw Hephaistos bustling through the palace. And why does the sight of Hephaistos bustling stir up such laughter, and why is it marked by the particle ἄρα, which signifies that their laughter is what was after all only to be expected? Because he is 'περικλυτὸς ἀμφιγυήεις / Ἥφαιστος', 'famous Hephaistos, lame in both feet' (Iliad 1.607-08). Turning from Plutarch and Homer to Shakespeare, we see the magnificent villain, Richard III, revelling in and despising the stigma which his limp inflicts upon him (1.1.12-31). We can see it elsewhere, too, spread across his comedies, tragedies, and histories as well as the sonnets and other poems (see here). However much Tolkien may have preferred Old English and Old Norse, he was far from ignorant of Homer and Shakespeare; a knowledge of the history of the Greeks in the fifth and fourth centuries and a familiarity with the Lives of Plutarch would have also been normal for an educated man of his day (cf. C.S. Lewis, Letters, of 13 May 1917, 11 January 1939, 12 October 1940, 1 January 1949). So, if an author like Tolkien introduces a character affected by a physical disability, the author may well be using that particular disability to suggest something. When that author introduces a second character with the same disability, it becomes difficult to claim that the author is not suggesting something. But when the author brings in a third such character in a pivotal role, we have only ourselves to blame if we fail to see that some point is being made. Thus we have The Children of Húrin, in which Tolkien gives us three characters who have a limp. Early in the tale we meet Sador. Maimed by an accident while cutting wood, and thus unable to serve Húrin, his lord, as a fighting man, Sador works as a servant in his household, making and repairing things (40-41). Morwen and Húrin treat him with indulgence, though they believe he could spend his time better than he does (49-50, 72). Young Túrin, however, loves him and spends much time talking to him and learning things about life he has not learned from his parents. He affectionately calls Sador 'Labadal', that is, 'Hopafoot', which in his childlike way Túrin means as an endearment, and at which Sador takes no offense because he knows that it is meant 'in pity not scorn' (41). Yet Labadal is Túrin's first attempt at naming, the first of many he will make in his life, and it succeeds, to the extent that it does at all, only because Sador is wise enough not to take offense at its misapprehension of reality. 'Labadal' is the beginning of a series of names through which Túrin comes to challenge the world around him, culminating in Turambar, Master of Fate. It is late in the tale, when Túrin comes to Brethil where he will give himself the last of his names, Turambar, the Master of Fate, that Brandir enters the story, the second of the limping characters in The Children of Húrin. Unlike Sador, Brandir's disability arises from 'a leg broken in a misadventure in childhood' (193), but it also unfitted him for war, especially since he was already 'gentle in mood'. Like Sador, Brandir has more interest in wood than metal (41, 72, 193), with which we may contrast the importance of metal, both practically and symbolically, in Túrin's life -- the knife which he gives Sador as a gift, the dragon-helm that declares his identity as rightful Lord of Dor-Lómin, and the black sword with which he kills Glaurung, Brandir, and himself. Unlike Sador, however, Brandir is the lord of his people, a people at war whom he cannot lead in battle, which is of course his role. Both Sador and Brandir also have crucial roles to play with Túrin's sisters. It is to Sador that the young Túrin turns when his beloved sister, Lalaith (Laughter), dies in childhood as a result of a plague sent by Morgoth (40-44). It is from Sador that Túrin first learns about the inevitability of death as the fate of all Men. It is from Brandir, on the other hand, that he learns that 'the feet of his doom were overtaking him' in his tragic ignorant marriage to Níniel (Maid of Tears), his 'twice-beloved' sister (250-56). And just as he had called Sador 'Labadal' in love and pity, he now calls Brandir 'club-foot' and a 'limping evil' in wrath and scorn. And just as 'Hopafoot' had told him of all that Men could learn from the Elves, it is the elf Mablung who teaches him the truth of 'Club-foot's' words. From the bewept Laughter to the beloved Maid of Tears, from the dear Hopafoot to the despised Club-foot, from the lore Men can acquire from Elves to the lesson of doom that Mablung brings, these two characters and their lameness frame this tale, both narratively by appearing at its beginning and end, and tragically by their involvement in and commentary on the life not only of Túrin, but of Man overall. Túrin is not lame or maimed himself, but two important characters in his tale are so afflicted: Sador [...] for whom young Túrin feels pity; and Brandir [...] whose position Túrin usurps as an able-bodied warrior. In Oedipus' case lameness is a sign of his real identity, while Túrin's reaction to lameness shows his change from sensitive youth to rash warrior, who associates the wilderness with aggression in order to channel his dangerous wrath. 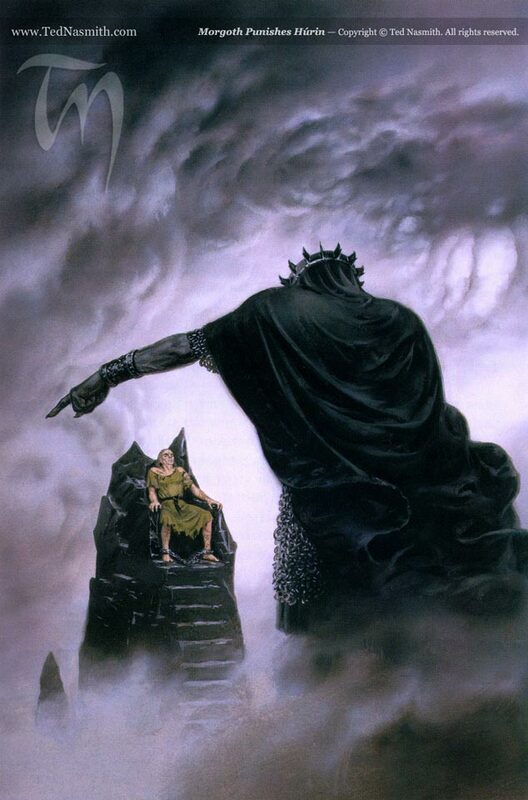 While I wholly agree with Fimi about 'Túrin's reaction' -- indeed he had previously usurped the authority of Orodreth at Nargothrond, whose leadership is also weak and who could be seen as metaphorically lame when viewed alongside Brandir's (CoH 160-65, 171-76) -- I would argue that there is more to be said about lameness in The Children of Húrin. Indeed, as Fimi has shown, the correspondences between the two stories are extensive. For anyone familiar with Oedipus, that Túrin himself is not lame is immediately noticeable but not necessarily noteworthy. After all, as Tolkien also pointed out, Túrin owes 'elements' to Sigurd and Kullervo as well (Letters, no. 131). Yet the development of lameness as a metaphor through not two but three other characters who play important roles in Túrin's life indicates that Tolkien was after something bigger here. Considering the third of these characters will help us see what that is. 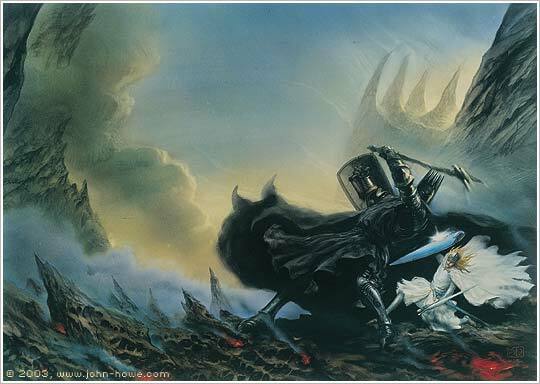 For Morgoth is the third character, whose malice towards Húrin and his family drives the tale as much as Túrin himself does. Curiously, slyly, Tolkien never openly says in The Children of Húrin that as a result of his duel with Fingolfin 'Morgoth went ever halt of one foot after that day, and the pain of his wounds could not be healed' (Silm. 154). He does, however, emphasize that 'Morgoth hated and feared the House of Fingolfin, because they had scorned him in Valinor and had the friendship of Ulmo his foe; and because of the wounds that Fingolfin gave him in battle' (CoH 60, italics mine). Note the construction of this sentence. Rather than say that he hated Fingolfin's house because of a, b, and c, which would be the common way of phrasing it, Tolkien says that he hated them because of a and b -- pause (thus, the semicolon) -- and because of c. He thus quite literally singles out the final reason and signals through the balance of the sentence that this reason is of special importance, perhaps even of equal importance. And of the eight wounds which Fingolfin inflicted on Morgoth, the only one specifically named is the last, the wound that maimed his foot. But Ilúvatar knew that Men, being set amid the turmoils of the powers of the world, would stray often, and would not use their gifts in harmony; and he said: ''These too in their time shall find that all that they do redounds at the end only to the glory of my work.' 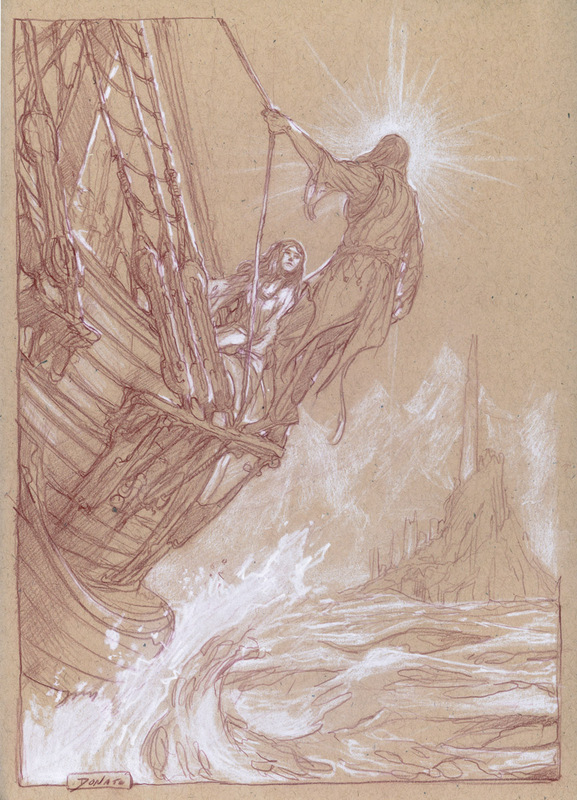 Yet the Elves believe that Men are often a grief to Manwë, who knows most of the mind of Ilúvatar; for it seems to the Elves that Men resemble Melkor most of all the Ainur, although he has ever feared and hated them, even those that served him. For the moment I will say only this: get this book; read this book; read it again.